It’s that time of year again folks. The holiday season is almost upon us and with it comes the new release of Skylanders. 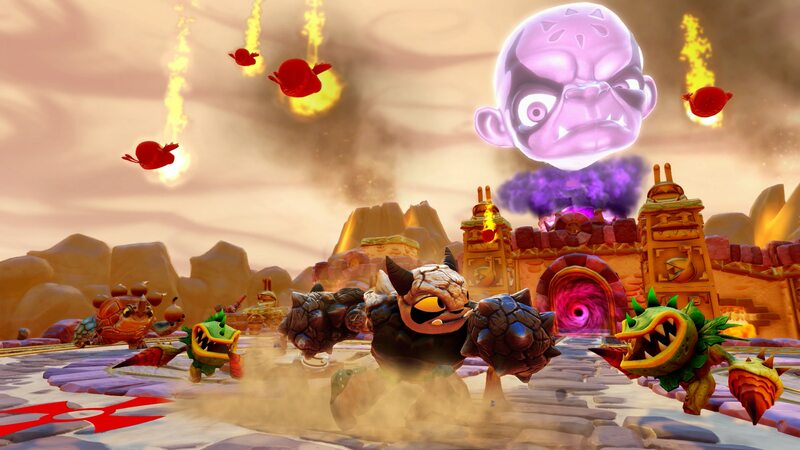 This time around it is going to be called Skylanders Trap team and includes with it the ability for players to capture certain enemies and use them like they do their (massive) collection of figures. Toys for Bob is at the helm for development again this year (they are the company that was responsible for the first game in the series) and they are going out of their way to try and innovate on the Skylanders formula this time around. The ability to capture bad guys is interesting and might turn out to be a lot of fun. The real question is going to be how difficult it will be to locate and capture them; we’ll find that out once the game comes out on October 5th. Activision sent out a press release this week announcing an all new game play mode called the “Kaos Doom Challenge.” It didn’t give a lot of details, but the new mode will task players with using their collected Skylanders figures, as well as the enemies they have captured in Trap Team, to help defend themselves from one hundred different waves of Kaos’s minions. It appears that this will be a tower defense style game where the minions will walk a set path and players will be setting up towers, walls, and other defenses to help slow their advance and defeat them before they reach a certain point. We obviously don’t know how well this mode will be executed, but it is very exciting to see that they are experimenting with new game play modes as opposed to just churning out more figures and leaving the game experience the same year after year. I don’t normally include the text from press releases in my articles, but this one was well written and presented in the voice of Kaos, the villain in the series. It is worth posting here just so everyone can get a good laugh out of it! Attention, foolish human fools! Activision Publishing, Inc., a wholly owned subsidiary of Activision Blizzard, Inc. (NASDAQ: ATVI), is officially announcing an all new diabolical gameplay mode in honor of me, Emperor Kaos, the most infamously evil villain in all of Skylands! In my glorious “Kaos Doom Challenge,” sniveling Portal Masters like you can feebly battle through increasingly difficult waves of my personal minions using your ridiculous army of Skylanders. And since you obviously won’t stand a chance, I, Kaos, will graciously allow you to build defensive towers and battle my fearsome allies using any of your Skylanders from your entire collection. However, when you bumbling Portal Masters utterly fail to progress past my hordes of evil underlings, the “Mystery Box of Doom” will be opened – which will then incomprehensibly spit out gigantic villains that will completely destroy you! And because I am both benevolent and merciful, I will even let you fools use any of your pitiful Trapped Villains to fight them. The Video Games on the 2014 Toys”R”Us Hot 15 List!